EVE Online players have been officially invited to dive Into the Abyss. The game’s latest expansion revolves around newly-discovered Abyssal Deadspace, which claims to be beautiful and deadly new space to explore. Players can expect to find rich rewards and deadly new foes in this largely PvE-centric new expansion. Abyssal Deadspace offers a brand new experience to EVE Online players of all types, from tenured veterans to the freshest-faced newbies. These new areas of space can be entered on demand, and provide players a fast-paced, challenging experience that can prove to be massively rewarding. A major complaint about EVE Online is that it takes quite a bit of time to play, and the introduction of this kind of on-demand, short session content allows players to login to EVE and undock to instant action. Abyssal Deadspace pockets are located outside of the normal game world of EVE Online. Think of them as instanced dungeons spawned for each player, on demand. 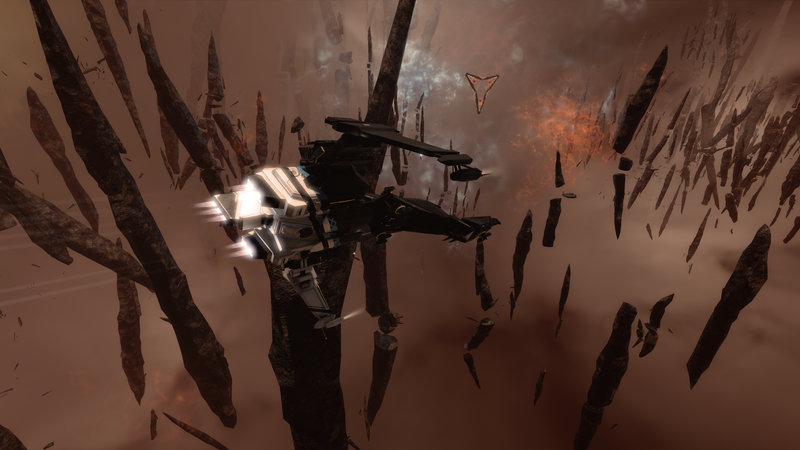 Because the areas are disconnected from the game world at large, EVE Online developers have been able to implement new graphics and mechanics that would be impractical to deploy onto the game’s wider universe. Asteroids the size of space stations float through storms of exotic particles, creating some of the most amazing sights ever to come out of an already beautiful game. Once a player enters an Abyssal Space pocket, their ship’s core begins to collapse from the stress of the chaotic energies, giving them only 20 minutes to defeat all of the varied dangers inside and escape with the spoils. Escaping in time isn’t the only concern though, since lurking inside of Abyssal Space are a new type of NPC introduced with this expansion. They come in several varieties, but all use the latest version of the advanced NPC AI that has been designed to act and react closer to how EVE players actually play the game. These new NPCs will attempt to counter player tactics, and even use some of the environmental dangers of Abyssal Deadspace to their advantage. Plasma clouds, arcane structures with pulsating AOE damage, and other spaceborne hazards fill Abyssal space, making each attempt to conquer it different than the last. The combination of ‘Space Weather’ type effects, dangerous new AI, and environmental hazards make for challenging and engaging gameplay. The highest tiers of Abyssal Deadspace are proving to be very difficult even for EVE’s most hardened veterans. A popular third party website that allows players to view kill reports on player ships has set up a feed specifically to showcase every ship lost to the new content. Only a few hours into the release of the Expansion, hundreds of expensive ships have already been destroyed exploring these new areas. Why are players so gung-ho about risking life and limb against these new AI opponents? Simple: the rewards offered inside Abyssal Space are almost too good to pass up. Inside of Abyssal Space, players can find a brand new type of item modifier called a mutaplasmid. Each mutaplasmid is attuned to a specific type of ship module—for example, an afterburner or an armor repairer—and can be used to modify that type of item. Once used, the mutaplasmid and the base item are fused into a new item with randomized attributes. In general terms, three or four of the item’s attributes are multiplied randomly by between 20 and 30 percent, negatively or positively. This process can make very unique and powerful items that can be sold on the market for significant profit, used on your own ships to make the next Abyssal run easier, or just ruined forever if the multipliers don’t go your way. Mutaplasmids promise to shake up a few areas of the EVE Online metagame, and have received mixed reactions from players since their announcement a few months ago. Players have expressed concerns that some combinations of the random module upgrades will cause massive imbalance in the game, but EVE developers have promised to keep a close eye on this. In addition to the mutaplasmids, players can expect to find blueprints and skill books relating to the ships that the new NPCs fly inside of Abyssal Space. Assuming they are successfully recovered, players will be able to master these new skills, and use the blueprints to craft the new types of ships introduced with this expansion. These Triglaivan ships carry a brand new and uniquely powerful weapon system which does more damage the longer it is continually fired at one target. Triglaivan ships are expected to provide more damage than any ship of similar size, which should immediately earn them spots in player arsenals all across EVE’s universe. Into the Abyss promises to provide quite a bit of PvE content for players who don’t have massive amount of time to dedicated to EVE Online in a single sitting. While the new ships are only pilotable by paid Omega-level players, EVE’s free to play, Alpha-level players are still able to enjoy all of the other content provided in Into the Abyss.